The main supplier of cable TV services in the UK is Virgin Media. They offer a digital TV service that offers more live TV channels than you’ll find on the subscription-free service Freeview, but Virgin offers less channels that their big rivals Sky Digital. Cable TV is delivered to homes using fibre-optic cables that run below street level. Cable TV is normally combined with an Internet service, and it’s only available in some parts of the UK, typically areas of high population. Until February 2007, the two UK big players in cable TV were NTL and Telewest. The two companies are now one, and the major UK Cable TV firm is "Virgin Media". To get Cable TV at home, you need to be in a cable coverage area – this means that one of the cable firms has run their special fibre-optic cable to your street. Assuming you’re in a cable area, you can arrange to get connected to Virgin Media’s cable TV, phone and Internet service. To get connected, a Virgin Media engineer will need to call and connect their cable service from the street into a special cable TV set-top box. Once connected, you can start to watch a range of cable TV channels and video-on-demand programmes and films, as well as getting your broadband Internet and phone service over their network. Virgin Media offers digital TV, broadband and home phone services in a number of areas around the UK. If you’re in a cable TV area, Virgin offers a number of different TV packages, the top one of which, ‘Extra Large’, offers over 160 channels, including ITV2, E4, MTV, Film4, Virgin Central, Eurosport and GOLD. You can add extra subscription services such as Sky Sports and Sky Movies, as well as adult services. On-demand: Virgin Media’s digital TV offering also includes Virgin TV On Demand service, which offers on-demand viewing of over 500 movies, as well as instant access to 1000s of TV shows and music videos. Catch-up TV: Virgin Media also offers a number of TV shows from the last seven day’s TV available on demand, so you can catch up on any shows you may have missed. Catch-up services are available from the BBC iPlayer, ITV and Channel 4. 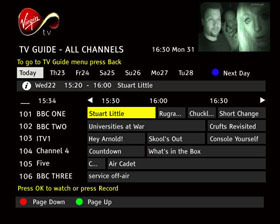 Virgin’s digital TV offering has some other optional extras – such as the Virgin V+ hard-disk recorder, and HDTV (High definition). You need to be in a Cable TV area. Prices depend on the package you sign up to, but you can currently get Virgin Media’s TV channels for £6.50 a month if you go for Virgin’s home phone service too. Records up to 80 hours of cable TV. Supports HD Hi-definition (over 25 channels). Allows recording of two TV channels, while watching a third. Outputs: 2 x SCART sockets, 1 x modulated RF output, 2 x audio phono outputs, and 1 x HDMI (Hi-def) socket. See our Virgin Media V+ Box Review page for a picture of the v+ box connectors. Virgin Media also offers Broadband Internet and telephone packages, which can save you money when combined with your digital TV service. Is cable available in my area? To find out if you’re in a cable area, go to http://www.virginmedia.com and enter your postcode. If you’re not in a cable area, you can still benefit from Virgin’s broadband and phone services – but you won’t get the benefits of their high-speed fibre-optic connection – details on Virgin’s site. If you want the definitive answer on when (or if) cable will be coming to your area, you’ll need to ask Virgin Media direct – here at Radio&Telly, we have no information about Virgin’s expansion plans. You can contact Virgin via http://www.virginmedia.com. No coverage? If you can’t get Virgin, consider TV delivered via satellite, a TV aerial or over the net. Check out our Digital TV Options page. We can also recommend YouView from BT. Like Virgin, they offer TV content and movies on-demand over the Internet. They are no more. Telewest and NTL were rivals in the cable market. In 2007, they joined forces under the Virgin brand to become Virgin Media. On the first of March 2007, the Sky channels Sky One, Sky Two, Sky News, Sky Travel and Sky Sports News were dropped from Virgin Media’s Cable TV lineup, after Virgin failed to renew the broadcast contract. There was lots of controversy about this at the time, something we covered in show 13 of our podcast. From November 2008, the dispute was resolved, and the missing Sky channels finally returned to Virgin. How do get a cable company to make the decision to lay cable in your area? Very hard to do these days – It has to be in the company’s financial interests to dig up the roads and lay cable. First off, contact the cable company in question direct. I notice the definition and colour quality of Virgin Media’s HD cable tv service is inferior to that of Freeview. I’m finding it impossible to find any technical details of Virgin Media’s service. Is its inferior quality due to lame up-scaling?